HOW WILL YOU FILL THE HOLE? 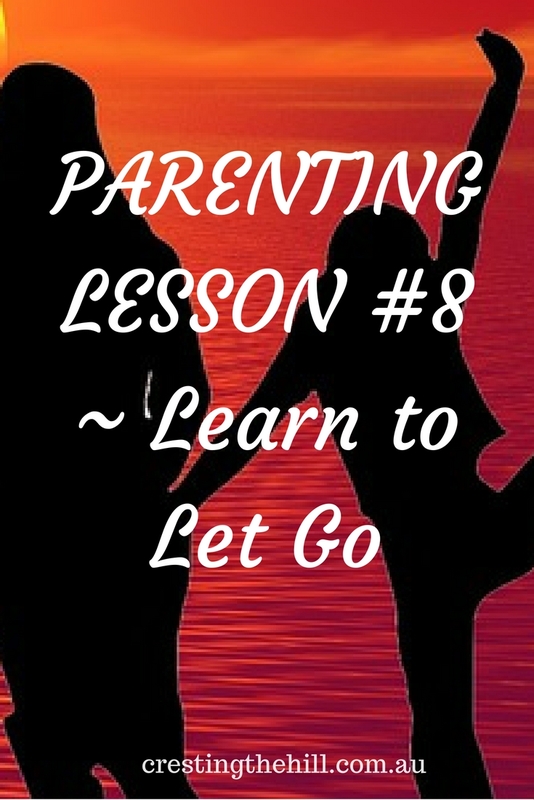 One of the hardest lessons for a parent to learn is how to let go of our children. We have invested so much of ourselves into them and they are such a huge part of our lives, what will we do when they leave? 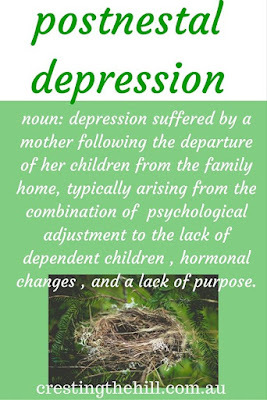 I've seen so many women suffer the agonies of the empty nest because they held on so tight and when the time came for their children to leave it was a huge wrench to their hearts and they were left with a gaping hole to fill. Many struggle to find something to fill that hole with. In fact I've seen it affect some women so badly that I've even coined a term for it - Postnestal Depression (similar to Postnatal but caused by having children leave rather than having them arrive). What we need to do is start to let our children go gradually. 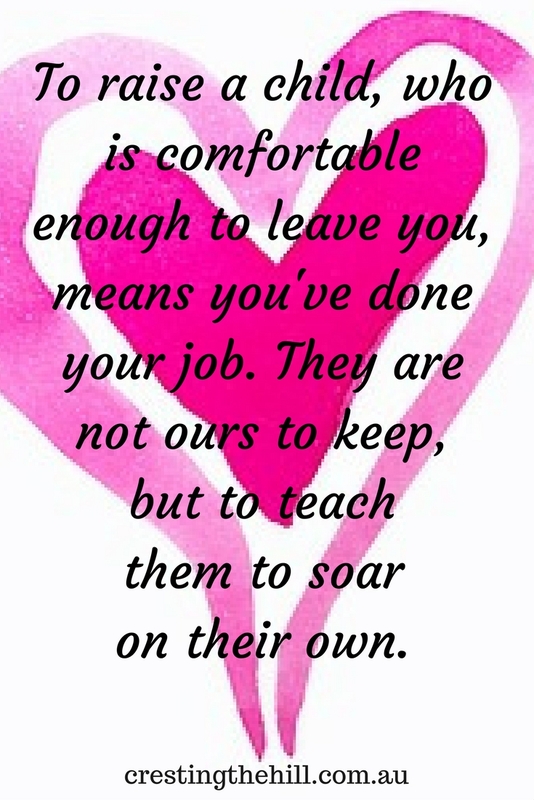 You need to have equipped them to leave the nest and to be able to survive and flourish on their own. They need to be able to cook and clean competently - if they choose to eat MacDonalds for every meal, that is up to them - but it should be by choice, not by necessity. They should also not need their mother cooking multitudes of meals for them to store in the freezer to feed themselves with each night - that is not independence. I know mothers who visit their adult children and clean their house or apartment for them - that is just not on! Why would anyone want to have their child so incapable as to need their mother to be their cleaning woman. Living in squalor may not be what we want for our kids, but if that's what they choose, then so be it. Most landlords won't stand for it, so they have to clean up for rent inspections at the very least. I've heard of uni students who never change their bed sheets - we might think that's gross, but they're big people and it's up to them how they want to sleep. We also need to make sure that our children are articulate and self sufficient enough to hold their own in the big wide world. Cosseting them and never expecting them to step outside their comfort zones means they never learn conflict resolution, or how to ensure they aren't walked all over by more savvy, worldly wise people. You can't phone the complaints line for them indefinitely, sooner or later they need to do it for themselves. If they never leave the family home, they never learn to take care of themselves, whenever there is a crisis they throw their hands up in the air and expect to be rescued - not good! 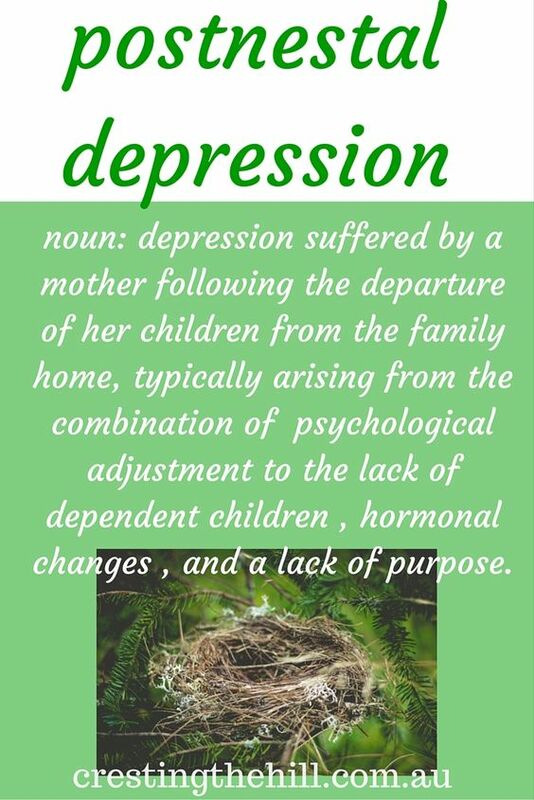 There is nothing sadder than seeing a midlife woman who is completely at a loss because her nestlings have flown and she hasn't got anyone to mother any more. Letting go needs to happen gradually over a period of time. We need to spend time away from our older children - let them stay at friends' houses, with grandparents, at camps etc. We need to learn how to keep the connection alive with our partner so we have something to talk about when the kids aren't around. We need to find new interests to fill our time and keep us engaged and interesting. Understanding that your children will leave home and make a life for themselves and preparing them (and yourself) for that eventuality makes for a much smoother transition. Worrying about all the things that can go wrong, trying to make everything as easy as possible, not letting them struggle to find their feet - all these things lend themselves to dependency and disaster. In Australia we have a term "boomerang kids" which refers to young people who leave home, can't cope for whatever reason and boomerang back home to be looked after by their parents. Having an adult child who can't look after themselves, or who can't support themselves is not a good recipe for their future life. How are they going to invest in long term relationships, or marry and pay a mortgage? How are they going to save for a trip or for a new car? How are they going to have anything interesting to talk about if they are still living in their childhood bedroom and having their cooking and laundry done by mum? We need to stop clinging to our children, instead we need to be encouraging them to take the risks that life offers. If they want to move out then help them make it happen, bring care packages as a treat - not as an expectation. Visit them and have them visit you - but not all the time. Don't pay their bills for them, don't keep them dependent on your largess, let them figure things out for themselves. Life is exciting and has so much to offer young people - don't hold yours back because you are too scared to let them go. It is so hard to let them go but if we don't they will never find out who they are. I loved your quote about postnestal depression. 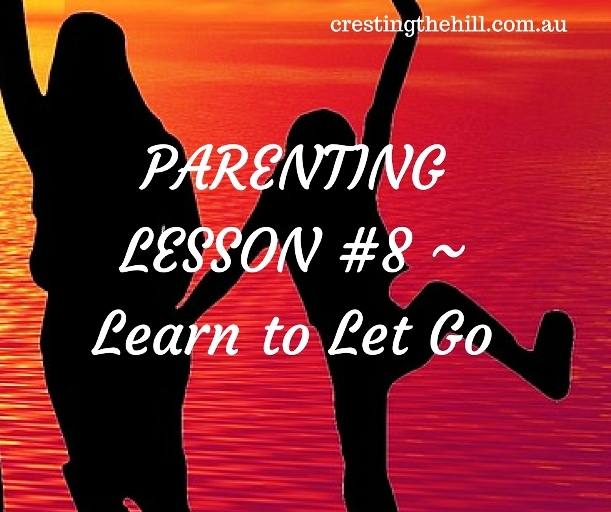 Some people really don't cope well when the children leave the nest but they are usually the ones who have probably built their lives around their children and not so much about their own identity. Thanks Sue - I thought there were a lot of symptoms in common between postnatal and postnestal - there is upheaval at both ends of family life but we have a lot more say in how we deal with it when our kids are leaving than we do when they are arriving! 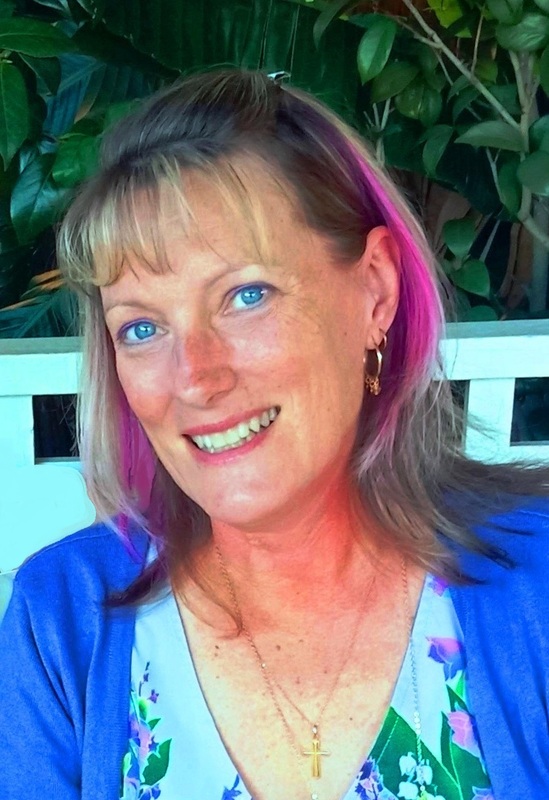 I think once we get our heads around the fact that our role isn't "mum" anymore then we can start looking further afield for our own fulfillment Mary Lou. I think most parents fly by the seat of their pants. Your advice is spot on. Oh Leanne, I'm in the middle of this letting go process right now. I believe and agree with everything you mentioned. My oldest is in her junior of college, now and I think I've gotten through the transition with her very well. However, when my youngest leaves, I think this will be hard. This why I've already started filling my hole with "me" stuff. Blogging is part of that! Great info! It is difficult when so much of where we focused attention for decades leaves us. But it is also a liberating time and a chance to bloom. Wonderful post. I agree Nancy - it's our attitude to the whole thing isn't it? If we look at it as a natural progression and time to find ourselves again then it becomes a time of joy instead of grief. Yes, yes and yes. This advice is so needed for young mothers. You need to start when they can spend time at friends houses, relatives houses and camp. They will always come back. But your job is to make them good people to have their own great life. I think this is a curse of our generation. I'm pretty sure my mom, with 6 kids, never had an empty-nest moment, except a sigh of relief that we all made it 'out' ok! Thanks so much for the affirmation Cathy - it's so hard hearing young mums revolve themselves completely around their children - to the point where they don't know where the separation point is. You can't hold onto them in a tight grip or you'll lose them down the line. You have to let go gradually and graciously. Yes, yes, yes. Of course. But hey, it is still hard to see them leaving the nest! I love the relationship that evolved with my sons after they left home. Each stage of our children's lives can be wonderful if we realize that, yes, they're going to get older, change, and eventually leave home, but they will always be our sons and daughters. Thanks for sharing at the Blogger's Pit Stop. I agree Debbie - it's a richer and completely different relationship once they set up on their own. It changed again when my children got married - it just keeps having extra layers added and I think that's wonderful. My daughter is a freshman in high school and I'm already dreading this day!